There are a number of chronic kidney disease risk factors, but a lot of nutritional research shows that a chronic kidney or CKD diet that takes sodium and potassium intake into careful consideration, can make a big difference in keeping kidneys healthy. Just under 30-million Americans suffer from chronic kidney disease. It’s an ailment that can lead to kidney failure. It also increases the risk of heart disease and early death. In order to maintain good health – including kidney health – a proper diet is key. People who suffer from chronic kidney disease should have what is referred to as kidney-friendly or chronic kidney diet. The CKD diet is about maintaining a healthy weight and sticking to balanced meals that are low in salt. This can help control your blood pressure, which in turn can help prevent diabetes. Keeping blood pressure and diabetes under control could help slow down kidney disease. The CKD diet limits specific minerals from the diet to stop waste from building up in your blood. A dietary imbalance of sodium and potassium is not uncommon. Many people in the United States either eat too much sodium or too little potassium. This imbalance is not good. It can put people at a greater risk for cardiovascular problems. 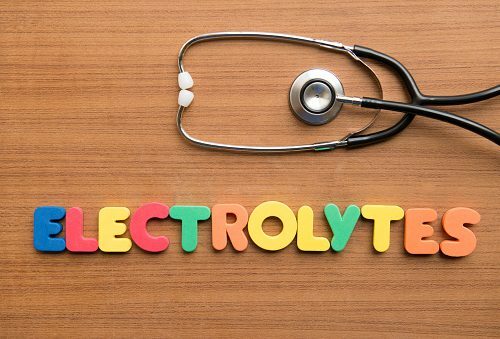 Potassium and sodium are minerals that work as electrolytes in our body. They are like charged particles that carry an electric force across cells. This electricity helps perform important work, such as contracting muscles, transmitting nerve impulses and maintaining heartbeat. So you can see why a good sodium and potassium balance is important. One of the best ways to keep our sodium and potassium balance in check is to consume more fresh fruits and vegetables and less processed foods. It is worth noting that a lot of people who don’t get enough potassium, and suffer from what is called, “potassium deficiency,” generally don’t have the problem because they eat too little of this mineral; they are often deficient due to excessive vomiting or diarrhea, overuse of laxatives, and alcoholism. With an extreme potassium deficiency you can experience abnormal heart rhythms that can be fatal. In a recent study, researchers at Tulane University tested urine samples from 4,000 people with chronic kidney disease. They consumed much more sodium and potassium than the recommended daily limit. They consumed about 3,700-mg of sodium, as opposed to the regularly suggested 2,300-mg. The research team discovered the high sodium levels along with the extra potassium were linked to an increased rate of disease progression. The researchers believe the results could lead to new guidelines on how much sodium and potassium individuals with chronic kidney disease should be having on a daily basis. They also suggest that future clinical trials could test the effects of a moderate reduction in sodium and potassium intake on chronic kidney progression in people with high sodium and potassium diets. Kidneys help filter waste products from the blood, and while they are strong organs, they can take a beating with the wrong dietary influences, such as too much sodium or too little potassium. Most people in the U.S. eat more sodium than the recommended 2,300-mg each day. Meanwhile, they only get half of the suggested daily potassium, which is set at 4,700-mg per day. The sodium to potassium ratio is important because recent research indicates potassium offsets the impact of high sodium by helping to lower your blood pressure. Not adding extra salt to foods and steering clear of foods with high salt content, such as canned vegetables, eliminating processed foods and eating more fresh produce, are ways to improve your sodium to potassium ratio. When you take the time to read labels on the food items in your local store, you will see how quick and easy it is to develop high sodium levels. Generally, we don’t have to worry about consuming too much potassium through food. It normally gets to dangerously high levels if people over-supplement. Many people find it hard to get enough potassium from food, so supplementing is a good option; just be sure to follow proper guidelines for taking them. For those who want to focus on potassium rich foods, there are a variety to choose from, including nuts, bananas, oranges, broccoli, tomatoes and potatoes. You do have to be careful with potatoes because they are also high in rapidly digested carbohydrates. In scientific terms, they have a high “glycemic index.” Foods that have high glycemic indexes can cause weight gain and increase the risk of heart disease, high blood pressure and heart disease. If you are interested in using diet to prevent CKD, you might want to first determine how much sodium and potassium you consume each day. To figure out your sodium potassium ratio, write down all the food you consume for several days. Use the nutritional facts label to figure out the amount of sodium and potassium in each item. If the portion you eat is different than the serving size on the label, adjust according. Compare the amount you consume to the recommended daily intake. Diabetes, high blood pressure, high cholesterol, heart disease and obesity are all risk factors for chronic kidney disease. All of these risk factors can also be linked to diet. A nutritious, well-balanced diet is what our kidneys depend on. If we want to avoid the risk factors that can speed up chronic kidney disease, we have to take diet into consideration. Some people find it really hard to lower salt intake, so they turn to salt substitutes. It’s important to know that many salt substitutes are high in potassium and can throw off your sodium potassium ratio. If you are going to use a substitute, you should consult with a qualified dietician. o 1,500-mg per day. Data shows that right now the average American consumes over 3,300-mg per day. When it comes to potassium, the U.S. guidelines suggest 4,700-mg for adults over the age of 19, adolescents between 14 and 18, and pregnant women. Nursing women need more; about 5,500-mg daily, while infants and children up to the age of 13 need between 400- and 3, 800-mg depending on age and weight. Changing diet can be difficult for some people, but the good news is that salt content, for example, can vary depending on what brand or variety of food you are looking at. If there is an item that you really like, but you are worried about the salt content, try comparing brands – you just might find a different brand from your usual that is lower in salt. It is also important to keep an open mind if you want to avoid chronic kidney disease risk factors. For instance, you can’t deny there are certain soups, cereals and sandwiches that contain a lot of sodium; however, there are a lot of alternatives that you might like if you are just willing to give them a try. To describe the symptoms of chronic kidney disease as unpleasant would be an understatement. Some people experience fatigue, fluid retention, shortness of breath, headaches, chest pain, erectile dysfunction, frequent urination – the list goes on. More and more evidence seems to point to the fact that a sodium and potassium balance can play a big role in holding these symptoms at bay.